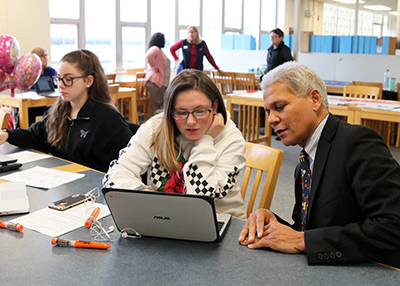 Manchester Schools Superintendent Bolgen Vargas (right) chats with Manchester West seniors Kimberly Stone (center) and Angelina Fontanez (left). Dr. Bolgen Vargas, superintendent of schools in Manchester, believes that the reform effort being spearheaded by the Manchester Proud public school reform initiative can propel the city’s school system into being a national leader of innovation to meet the complex demands of 21st century education. While Vargas understands the less-than-sterling outside reputation of Manchester’s public schools, he believes it ignores the strengths and innovations already taking place in numerous schools despite school funding shortfalls. Vargas has worked closely with Manchester Proud from the beginning. By offering deep community-wide engagement and helping to map a 10-year strategic plan, he believes that Manchester Proud could be a dynamic, sustainable fulcrum. Many urban efforts started in the 1900s were doomed to failure because they failed to address the issue of inequality, said Paul Reville, a professor at the Harvard Graduate School of Education and former Massachusetts secretary of education. In the New England region alone, Reville points to Salem, Mass., which has employed individualized success plans for every kindergarten through 8th grade student, and Providence, R.I., which offered 850 students high-quality summer learning programs that a study showed have already led to higher academic achievement. Spearheaded by nationally recognized education innovator Geoffrey Canada, the Harlem Children’s Zone in New York has been one of the most notable in longevity, combining education and community social services to break the cycle of poverty and prepare students for college and trade schools. It began as a one-block project designed to combine education, family and community and health resources and has grown to almost 100 blocks serving more than 25,000 students and adults. In 2017, the HCZ Promise Academy graduated the first class of students who had joined the school as 1st-graders in 2005. Every graduate had been accepted to at least one college. In some ways, Fogarty said Manchester is a smaller-scale and less-diverse model for Pittsburgh. As Pittsburgh, a city with 54 public schools and 24,000 public school students speaking as many as 45 different languages, transformed itself from an industrial powerhouse to high-tech hub, there have been no shortage of reform efforts to confront the challenges of school closings, crime, poverty and inequality for students of color who make up more than 50 percent of its student population. In 2002, after years of bureaucratic infighting that led to public disputes and vocal fights among school board members, Fogarty said some foundations began to pull away funding, so his organization was formed in 2004 to provide an independent watchdog. While A+ Schools has put a focus on strong principal and teacher leadership, Fogarty said community involvement is a key to reform. “Lately, parents and students are leading change on the ground,” he said. But change can be slow. After a big push, each Pittsburgh school now has a school nurse. A recent report by A+ Schools reported that more 3rd-graders were reading at grade level compared to three years ago, more African-American students were graduating and student suspensions were down 35 percent over the past three years. (Fogarty said that research tracking has shown that a middle-grade suspension can be a major red flag on future achievement). Yet the report also noted that too few students were doing math at grade level and African-American success rates varied widely by school. Money itself is not the problem in Pittsburgh, Fogarty explained, as the school district is one of the best-funded in Pennsylvania and the nation. A $40 million grant by the Gates Foundation was focused on effective teachers. A MacArthur Foundation grant in 2013 designated Pittsburgh as its third Hive Learning Network location in the country to encourage more out-of-school learning opportunities for kids and teens. Major local academic institutions such as Carnegie Mellon University and the University of Pittsburgh have ongoing programs in Pittsburgh public schools. The establishment of a “Velcro University” classroom at Manchester West High School came together earlier this year. It is an example of the dexterity required to bring innovative, private-public partnerships to fruition. What began as a discussion between local Velcro executives and Mayor Joyce Craig evolved quickly. Manchester West High School students participate in Velcro University, a program that introduces students to advanced manufacturing and career options with Velcro. The class will offer an extended learning opportunity credit for students, but Dichard believes the value will go even deeper than potential internships and jobs. “They will have the chance to learn about business culture, business essentials, technical acumen and more. They will learn how to manage health and life insurance. They will find out that English, math and science don’t exist in silos. When you get out in the real world, everything is intertwined,” he said. Manchester Proud could accelerate such private-public partnerships. The organization continues full speed ahead with more community outreach, workshops and listening sessions. According to the organization, by the end of October, 660 community surveys were completed by city residents to share their hopes, needs and concerns about the city and its schools. By spring, the input from work groups and the community will begin to be compiled and be the seeds of a long-term strategic plan. If Manchester Proud’s ambitions appear outsized, its advocates say it’s necessary. Editor’s note: This article is the second of two parts. The first part can be found here.